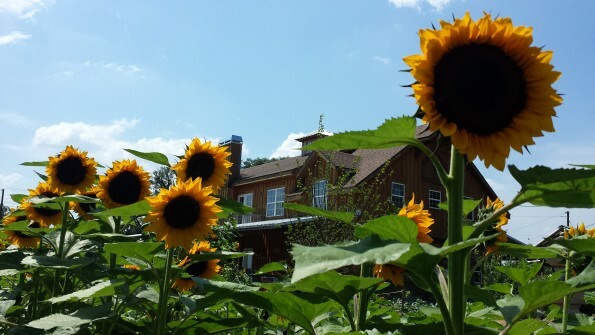 **Current Maze Status: Growing- 2019 Sunflower Season Dates Are Posted! ** See You For All The Sunflower Fun ! What is it?…A sunflower maze is a living labyrinth. Much like a corn maze only made of sunflowers. You will enter at a starting point and make your way through the paths in search of the exit. Throughout most of the maze our sunflower crop is are anywhere from eight to ten feet tall providing a whimsical journey for all ages. We are asked a lot “When is a good time to come?”. Spring Season with us is like a step back in time. A time when crowds were low and hospitality is high. When you can spread out a blanket for a picnic or sit back enjoy your family and friends, drink some fresh made to order lemonade, take in the fresh air, the adorable farm animals and all the beauty the farm offers. Our Sunflower crop is AMAZING! Going through so many different phases during season. Our Sunflowers start out “Lush And Green” at the beginning of season with blooms usually just starting to appear here and there on boarders and in gardens. This is when the challenge of the maze is at it’s best. the thick “Lush And Green” is difficult to see through and creates a great labyrinth. As our plants mature more flowers start to appear. We like to describe the next time frame “Scattered Blooms”.This is when you have pops of the vibrant yellow flowers sporadically through the field. This is a beautiful time and still has a lot of that lush green that the prior stage gives you. This allows for both a great maze challenge and the chance to see some towering flowers. Farmer Lisa ‘s Favorite is How you have the beautiful green heart shaped leaves still present and get to experience the contrast of the yellow bursting in the field. Next we come to what we call “Blooming” in the field. Flowers do not all open up and mature all together. So when we reach “Blooming” plants are mature to the point that the plants main focus is on the flower portion of the plant. This means a lot of the lush green contrast is lost as leaves start to drop and yellow. Young flowers will be plentiful and accompanied older flowers that are starting to drop their heads and produce seed. Our field of flowers is not designed to all bloom at the same time. This allows a better expression of stages and a longer opportunity for viewing. The truth is there is never a bad time to experience the field during spring except when it is over! As it undergoes it’s beautiful life cycle it bring through amazing butterflies, birds and memorable experiences.We do our best to predict the time our crop needs to make it through it’s life cycle. But Mother Nature is truly in charge. We have had past years that bad weather has caused our field to end early. Be sure not to procrastinate your visit or you could miss this great experience. There is so much to be discovered as you wonder your way through and so many wonderful moments to photograph (so don’t forget your camera). Let the beauty of our garden take your breath away. We can’t wait for you to see this year’s design. Our field is at the mercy of Mother Nature. We have only an idea of when blooms will start and end or how weather will affect our field. We recommend you not procrastinate your visit to insure you have a wonderful experience. Get Ready! Check Out The 2019 Spring Maze ! This Year’s Design Is Awesome! 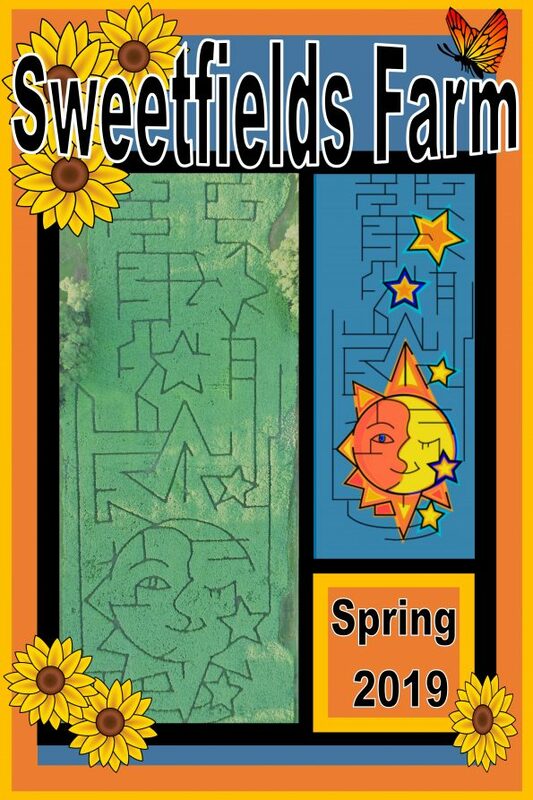 2019 Sunflower Maze – Opening Weekend April 27th and 28th! 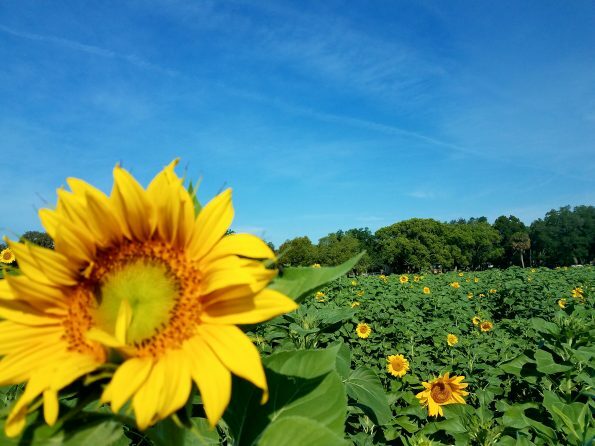 Open Saturdays and Sundays In May And Runs Thru Memorial Day (5/27) : 2019 Sunflower maze , Activities, Produce and Fun!! May 27th – Memorial Day Monday 10 am- 4 pm (last admission at 3 pm) THIS IS FINAL DAY FOR SUNFLOWER ACTIVITIES. * We are an outside activity and are subject to closing if weather is severe. Please keep this in mind when coming out as we do not offer rain checks or refunds on admission. Additional costs:Produce (u-pick or fresh gathered), Food/Drinks, Launcher (3 shots for $2),Paint Pot/Hat/Stepping Stone, Peddle Tractors, Animal feed (sometimes available for purchase). Ex-Squeeze-Me Lemonade (Fresh squeezed organic lemonade made on site) -joining us all dates! Nina’s Wood Fire Pizza (Pizza straight out of the fire) -joining us on all dates! Your Camera, Bottled Water, You Are Welcome To Bring A Picnic Lunch (we do also have snacks and drinks for sale) Wear Closed Toe Shoes, Sunscreen, Dress For Local Weather, and Your Best Behavior. *There is NO FLYING OF DRONES allowed on our property or in our air space with out prearranged written approval from us. CLICK HERE TO CHECK OUT OUR FARM RULES BEFORE YOU HEAD OUT!